The Business Model Canvas is Strategyzer’s most popular tool for strategy and innovation. Since its launch, The Business Model Canvas has been downloaded over 5 million times. The tool has been powerful in helping companies and organizations to think clearly and critically of their business models. Through the years, we’ve created content that continues to enhance the lessons that Alex Osterwalder and Yves Pigneur wrote in the global best-seller Business Model Generation. To save you time, we’ve pulled out some of our most popular and useful content to help you with your work. Examples of how companies (from startups to Fortune 500’s) apply the tool to improve strategy innovation. How to use The Business Model Canvas with leadership and teams inside your organization. We surveyed over 1,300 Canvas users and conducted 35 interviews with individuals in FT Global 500/Fortune 500 corporations, consultants, entrepreneurs, and academics. Our findings and some Business Model Canvas best practices are summarized in this beautiful research report. Check out 14 very different but very practical applications of the Business Model Canvas that we've observed first hand from our global community of practitioners. Take in ground rules and best practices when using The Business Model Canvas in this detailed webinar session. A simple checklist to gain clarity around your business model, and to capture the best business model story on the Canvas. Color-coding is a powerful way to display the connections within your business model; contrast current and future business models; or assess what is uncertain about your business model and what has been validated in the field. Even after 5 million+ downloads, there are common questions that people don't always dare to ask us. Here are 5 that we hear often. Use this approach to assess your business model environment for potentially disruptive threats or to seize opportunities that can improve or reinvent your business model. Use the Canvas to better understand external parties (such as customers, competitors, and partners). By better understanding their businesses you'll come to know their motivations for working with you or against you and you'll understand their possibilities and constraints. 'Constrained Prototyping' is an exercise to help you break through creative blocks and imagine radically new futures for your business. Try it out. Jay Galbraith's Star Model helps companies holistically create the organization necessary to sustain a company's business models and value propositions over time. Here’s how you can use it with The Business Model Canvas. The Business Model Canvas is a great tool for presenting new ideas and evidence. In this webinar, we go through best practices and advice for using the Canvas to give a killer presentation. Communication is at the heart of (co-) designing, testing, and implementing new or improved business models and value propositions. Discover how The Business Model Canvas helps people in medium to large organizations better co-create, articulate, and disseminate their ideas. We’re often asked how to integrate the Canvas into an organization and its process. Change isn’t easy inside an organization. Here’s how organizations that have successfully adopted the Business Model Canvas did it. We share how three organizations used The Business Model Canvas to make the task of onboarding new executives quick, easy, and painless for everybody involved. 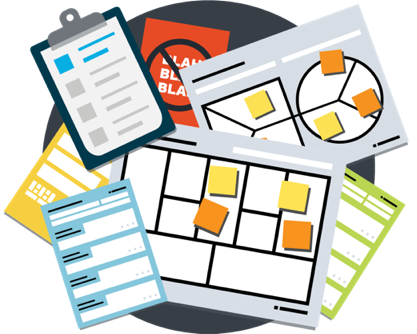 The Strategyzer Resource Library is full of free templates, tools, and guides on using The Business Model Canvas. Simply create an account to access.